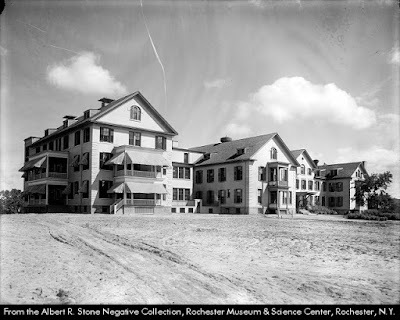 April 28, 1834: The City of Rochester is granted it's formal charter, following earlier incorporations of the village of Rochester in 1822 and Rochesterville in 1817. The population in 1834 was 12,252. April 27, 1933: The Genesee Brewing Comany, recently re-established from the former Genesee Brewery and parts of neighboring Bartholomay brewery, begins beer shipments following the end of Prohibition. Genesee's Liebotschaner Beer is announced as the best "Post-Repeal Brew". A victory party is held at the Power's Hotel with over 4000 in attendance. April 21, 1951: The Rochester Royals (who would later move and become the Sacramento Kings) win game 7 of the National Basketball Association (NBA) finals, beating the New York Knickerbockers. April 19, 1865: The city joins in the national observance of President Lincoln's funeral with a procession of mourners almost two miles long. April 16, 1958: The Haloid Company changes its name to Haloid Xerox. Originally formed as a photographic paper company in Rochester in 1906, the Haloid company would acquire license to Chester Carlson's patented electrophotography process in 1947 and launch the first XeroX copier in 1949. April 12, 1822: The village of Rochester is re-incorporated, dropping the redundant and unpopular "-ville" from the earlier 1817 incorporated name. The village remained limited to the west side of the river, with the population on the east side being part of the town of Brighton. The east side was annexed the following year. April 10, 1889: The Hahnemann Homeopathic Hospital (today Highland Hospital) opens to the public in a renovated mansion located in the hills overlooking the city. The Hospital, was founded by a group of local doctors following a recent school of medicine based in the use of natural remedies to stimulate a body's own immune system while shunning invasive traditional methods such as blood letting and mercury dosing and avoiding non-natural opiates such as morphine. The original hospital mansion on Rockingham Street and had only 12 beds, but was expanded in 1910 to a three story building (shown below). April 10, 1962: Rochester's Midtown Plaza officially opens. The plaza was intended to trigger a revitalization of downtown providing an enclosed European-style town square with a 75 degree year round tropical atmosphere. The Plaza officially closed in July 2008.